In a ceremony rich with Catholic tradition and Aboriginal culture, the Diocese of Darwin on Wednesday night welcomed Bishop Charles Gauci as its new shepherd. In June, Pope Francis announced that Fr Charles Gauci, then-administrator of St Francis Xavier Cathedral in Adelaide, would succeed Bishop Eugene Hurley, who had served in Darwin for the past 11 years. Pope Francis’ ambassador to Australia, Archbishop Adolfo Tito Yllana, read the apostolic mandate from the Holy Father, announcing Bishop Gauci’s appointment. Bishop Hurley served as principal consecrator at an overflowing St Mary’s Star of the Sea Cathedral. In his homily, Bishop Hurley welcomed Bishop Gauci to the Diocese, but also reminded him of the task that lies ahead. Bishop Hurley said trust between the people and the Church in Darwin has been built over more than a century. “This is a sacred trust, well-earned, but it brings with it a grave responsibility to walk with the people as a good shepherd must,” he said. Bishop Hurley said that the special bond between the Catholic Church in the Northern Territory and Aboriginal and Torres Strait Islander peoples is a privilege, but there are also significant duties. “The trust, reverence and love shown by our Aboriginal sisters and brothers over such a long time are sacred, and demand an equal commitment from the Church and from you as bishop,” he told Bishop Gauci. “You will need to listen carefully, observe closely and walk humbly with them as you assess the situation which confronts them. Earlier this week, speaking with ACBC MediaBlog, Bishop Gauci spoke of his commitment to responding to those challenges, among others. “When I visited the Indigenous people a few days ago, it was an eye-opener for me – their hopefulness, their warmth and their need to be connected spiritually,” he said. Bishop Hurley said despite the geographical size of the Diocese of Darwin – more than three times the size of France – there remains a closeness. “Even though the Diocese is vast, we have a strong and abiding sense that we are a diocesan family, united in faith and united in care and love of one another, however far apart we might be,” he said. 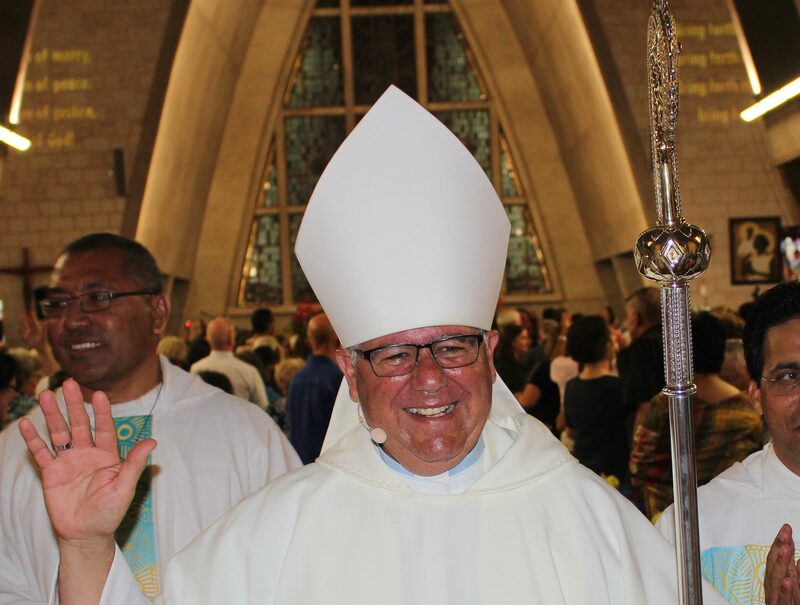 He expressed his desire to follow the example of Bishop Hurley, who has been “such a good bishop, so loved”, and in “continuing to build the Body of Christ” in the Diocese of Darwin.